This entry was posted on April 2, 2014 by Jessica Anderson. How do we give back to the community? Each quarter, our staff chooses a charity to support through our 'Awards for A Cause' program. This quarter, we have chosen the College Success Foundation as the program recipient. What is the College Success Foundation? The College Success Foundation helps students dreams come true! 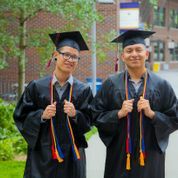 For more than 13 years, the College Success Foundation (CSF) has been a leader in improving college access and completion for thousands of underrepresented students throughout Washington State and in Washington, D.C. In 2000, CSF was founded in Issaquah, Washington by Bob Craves and Ann Ramsay-Jenkins to provide college scholarships and mentoring to low-income, high-potential students. CSF provides the unique integrated system of supports and scholarships to inspire under-served, low-income students to finish high school, graduate from college and succeed in life. CSF is headquartered in Washington State and includes its subsidiaries, Washington State Mentors and College Success Foundation – District of Columbia. Through its work, the foundation provides pathways for eligible students to succeed in college, and in so doing improves their economic future. Find out more and like the CSF Facebook page! Trophies2Go will make a donation to the College Success Foundation based on selected product purchases. To see the trophies and awards that will benefit the charity go to our 'Awards for a Cause' page. Thank you customers for supporting worthwhile charities in our community by purchasing 'Awards for a Cause' products!